I have around thirteen years experience of teaching art, being Head of Art at Bromsgrove School and Edgbaston High School for Girls; I’ve also served on the Subject Advisory Committee for Art & Design for AQA. I started doing workshops with schools, children’s groups and community arts organisations in 1993, and work with all age groups from Year One upwards. 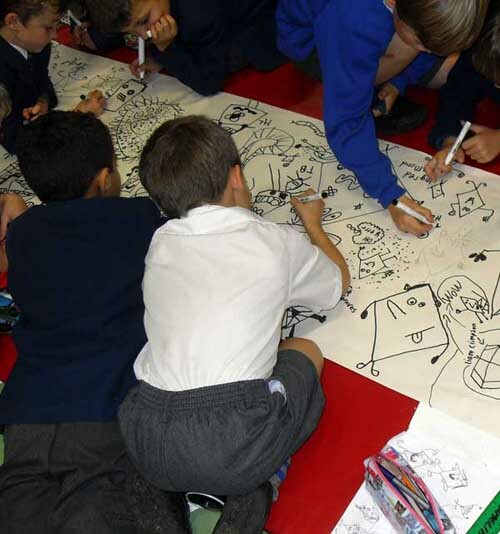 I’ve run workshops for North Birmingham Children’s Book Group, the Shrewsbury Cartoon Festival, the Herne Bay Cartoon Festival, the Big Draw, East Sussex County Council and many, many school visits all over the country. I’m happy to fit in with an individual school’s needs, and can provide workshops on a cartoon/comics theme, or general illustration for a specific project. 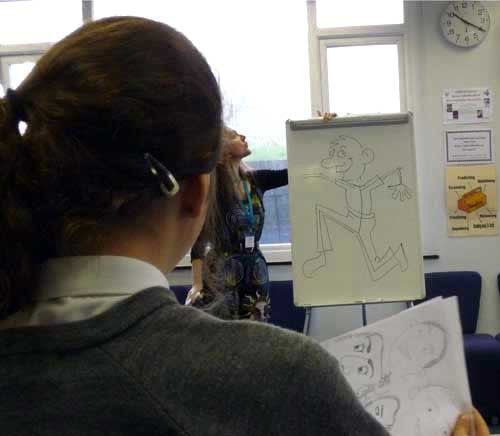 During the first part of the workshop, pupils will be shown how to create their own cartoon characters, and how to construct their own stories – and then turn these into ‘comic-speak’. This will usually take all morning. Then, in the afternoon, they will bring the two together and draw a cartoon strip each, with plenty of support and help. They will usually be divided into groups of six who will work on a comic together, decide what to call it and create a cover. It can then be taken back to school to be photocopied. With pupils at secondary level, this workshop can be adapted to ‘kickstart’ a GCSE project – I’m well aware of the relevant Assessment Objectives – or as part of a general enrichment activity for all year groups. Themes can be discussed in advance, but the workshop will consist of basic drawing techniques which can be easily adapted to create any kind of character or animal required. In the past, these have been used to create huge posters full of funny little people or a magical zoo of imaginary animals, smaller posters (at Sowerby Community Primary School, Thirsk, their posters went on to adorn pop-up shops in the town!) or illustrations for a book of poems also written by the pupils. This workshop is particularly suitable for engaging less confident pupils. Thank you for the workshop and being here and making it a super day! It was fab and the children all enjoyed having a whole day to work on something they love. I hope to do this again in the future, so please stay in touch! Cathy Simpson has run a number of workshops for the Campaign for Drawing, often at major Big Draw Launch events. She rises to the challenge brilliantly – engaging people of all ages and abilities in fun and purposeful activities. Not only does she have the imagination and ideas to make such activities enjoyable, but she is resourceful, reliable and resilient – all characteristics that the Campaign for Drawing requires from its top workshop leaders. Most recently Cathy devised and delivered a dynamic Miraculous Fishes workshop at the Victoria and Albert Museum, which related to the biblical scenes on the Raphael Cartoons in the V&A’s Raphael Cartoon Gallery. It was a triumph! 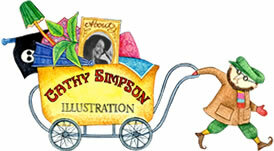 Cathy has devised and run cartoon workshops for the Shrewsbury Cartoon Festival for several years. Her workshops are wonderfully imaginative. We offer the workshops as drop-in sessions for all ages so Cathy never knows who is going turn up on the day. She is able to adapt on the spot to different ages and abilities so that everyone has fun and is able to go home proud of what they have created. My friend works for Chingford Hall Primary who sent students along to the session at Hale End Library, and we were talking last night about various work things. 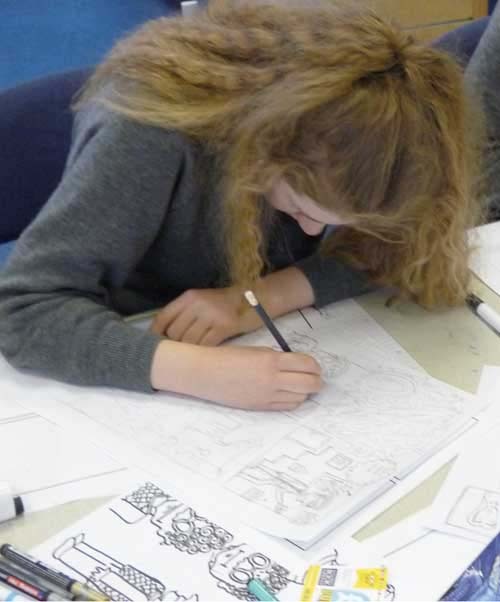 She then mentioned that after your workshop the children were so enthusiastic that they completed all of their comics, made copies and sold them, and raised around £70 for charity. This money was then donated to Haven House Children’s Hospice.